registering the presence of 400 children who filled Largo Padre Lomelino Barreto, to watch the arrival of Santa Claus. And while this did not happen, there was time for dance, theater and much animation by the students of the Basic School of the 1st Cycle with Preschool Vargem-Caniço. At 3 o’clock sharp, the Municipal Firemen of Santa Cruz brought Father Christmas for the fun of kids and adults. The apothecary arrival of the old man with the white beards was accompanied by the “snowfall”, leaving a white mantle in much of the Largo. At the end of the day, at 7 pm, it was the turn of the Blessing of the Crib with the presence of local entities whose ceremony was in charge of the parish priest of the parishes of Caniço and Eiras. 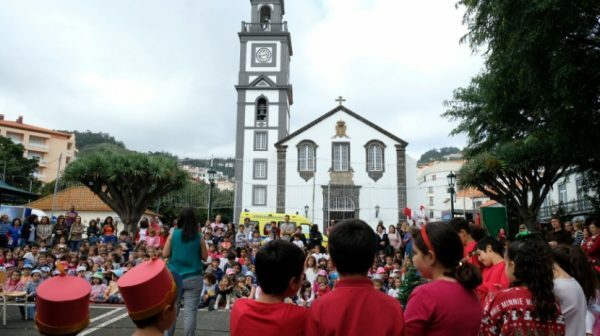 The ceremony was brightened by the Choir of the Church of Caniço and by the group of Young people of the Catechesis of Caniço. After the Blessing of the Crib, there was a traditional visit to the stalls and this first day / Christmas night in the ‘Fence’ was closed with the participation of Alexandra Barbosa who presented Christmas themes, giving another color to the Festa. Until December 30th, ‘Cerca’ will be open from 6pm.